We love this time of year, September issues of mags (have you SEEN Vogue?) and sensational new collections being launched everywhere you look. Exciting times for the discerning fashionista! To join in with the August excitement, we've added another A/W 2010 collection, Acrylic Art, to our website. Acrylic Art is one of the more zany Chelsea Doll collections, but we love it! Wearing one of these creations will certainly give your neck some time in the limelight. The pieces are all made from acrylic (if you hadn't already guessed from the title) and each is fantastic in its own right, buuuuut we had to select a few to show you. 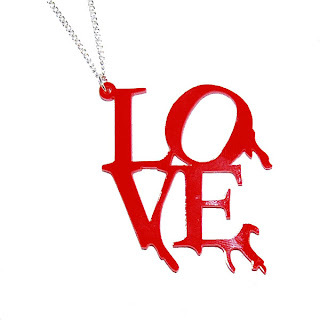 The first one is this Bleeding Love Necklace, priced at £10. We've had a few cutesie love necklaces in over time but this one is probably (secretly) our favourite! Sooo much 'arder than the pretty silver or gold versions. 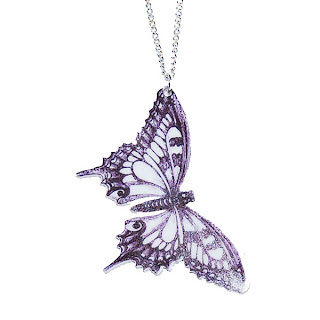 Moving onto a more elegant number, the Ink Effect Butterfly Necklace is beautifully artistic and makes a statement in a completely different way to Bleeding Love. A unique piece of jewellery and priced at only £10 - STEAL! 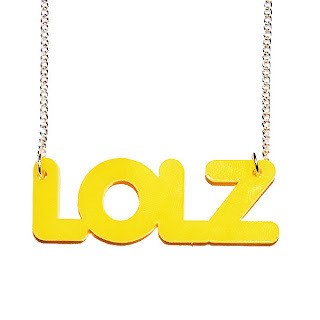 Lastly, we had to add an element of fun and we think nothing brightens the mood like this LOLZ Necklace. In the brightest of yellows, well that and the fact that there's a giant LOLZ staring you in the face, it screams with glee! Set the scene with this necklace, at a bargainous £10! If none of the above have taken your fancy, then take a look at other pieces in the Acrylic Art collection. There's a Mixtape Necklace, Vintage Detective Comic Necklace and Pin-Up Girl Necklace, to name just a few. It takes all sorts!